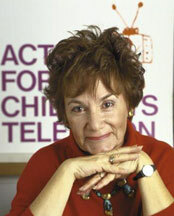 Peggy Charren, Founder and President of Action for Children's Television which was a national consumer organization founded in 1968. Located in Cambridge, Massachusetts, the not for profit organization worked to encourage program diversity and eliminate commercial abuses from children's television. ACT is no longer an active organization but Ms. Charren is an ardent and active advocate for quality children's media.